23:22 – A third time he [Pilate] said to them, “Why? What evil has he done? I have found in him no guilt deserving death. beautiful exchange of the Gospel. because the innocent son of the Father is condemned. knowing that we were that guilty son. and to lead us into many snares. because He is the true King of heaven. We make our prayer in His name, Amen. What an unforgettable encounter Pontius Pilate had with Jesus. Do you remember Pilate’s poignant words “Behold the Man” (in Latin, they are translated Ecce Homo). Those words still ring out today. This villainous moment in redemptive history has inspired numerous painters to graphically portray this scene from John 19:5. Furthermore, God has used Pilate’s words for His own redemptive purposing in launching His world-wide missionary endeavor. Here’s one example. One of these paintings by Domenico Feti was used to convert a young teenager by the name of Nicolaus Ludwig von Zinzendorf. 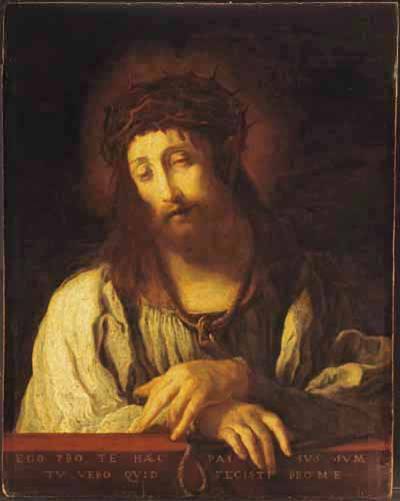 He was touring an art museum in Düsseldorf, Germany where he became enthralled with Feti’s painting entitled “Ecce Homo.” It portrayed Jesus with the crown of thorns on his brow with the inscription: “All this have I done for you – Now what will you do for me?” Ludwig was profoundly moved as he sensed Christ himself speaking those words to his heart. He vowed that day to dedicate his life to serve Christ. Count Zinzendorf became the father of one of the greatest missionary movements in Christian history – the Moravians.